Many bakeries seem to have a magic recipe for icing. The icing's creamy consistency and perfectly sweet taste appear to be difficult to imitate at home. However, making bakery icing at home is not only possible but can be simple. 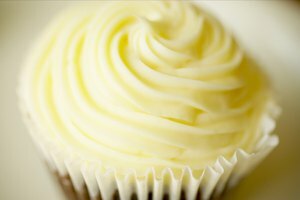 Buttercream icing is the most popular icing for bakery cakes due to its taste and decorating consistency. The classic version includes a combination of butter, powdered sugar, milk and vanilla. Soften the stick of butter by placing it in a microwaveable dish for eight- to 10-second intervals. When pressing your finger into the butter leaves an impression, it is sufficiently softened. Watch carefully during heating so that it does not start to melt. Cream the shortening and softened butter together in a large bowl with an electric mixer. When the mixture is blended thoroughly, pour in the vanilla. Add the powdered sugar. While beating the ingredients on medium speed, slowly add 1 cup of sugar at a time. Make sure the entire cup of sugar has been well-incorporated before adding the next cup. After all the sugar has been added, the icing should appear very dry and stiff. Stop the mixer and add 2 tbsp. milk. Begin to beat the icing again with the mixer on medium speed. Continue mixing until the icing is light and fluffy. Mix in more milk or powdered sugar as needed. If the icing appears too thick to be easily spread on the cake, add 1 tbsp. milk at a time, mixing until the icing is spreadable. If the icing seems too thin, mix in more powdered sugar in small amounts until it reaches the desired consistency. Color the icing, if desired. 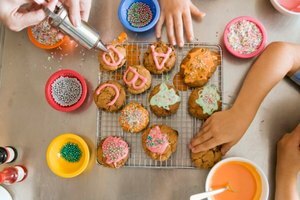 Use food coloring gel or icing colors to dye the icing. Place a small amount on a toothpick and then move the toothpick through the icing. Stir to distribute the color evenly. Add more coloring in small amounts until the icing reaches the tint you are looking for. Make chocolate buttercream icing by adding 3/4 cup of powdered cocoa before adding the powdered sugar. Fill a zip-top bag with the icing. Seal and cut off the bottom corner. Squeeze the bag gently to pipe the icing into a swirl on top of cupcakes or to write names and messages on a cake.